Most Americans have never been to Europe and are only vaguely aware that the best way to get around that continent is by train. I explain how extensive the European system is … how you can get from almost anywhere to almost anywhere conveniently by train. 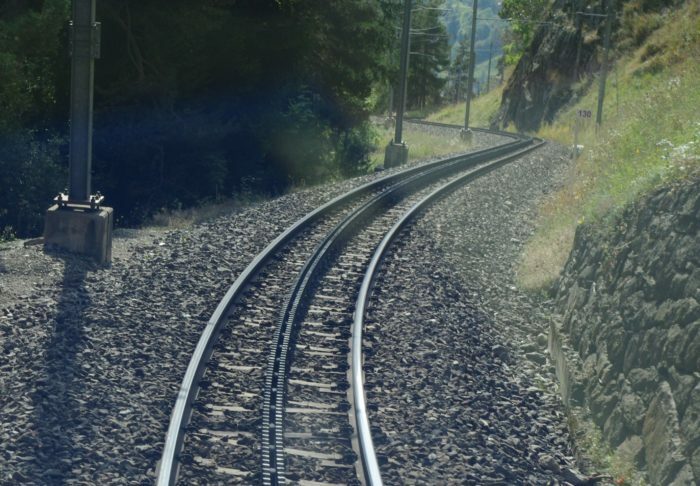 But when it comes to scenic trains, I recommend the Swiss trains, all of them … almost any of them … but specifically the Glacier Express and the Bernina Express. 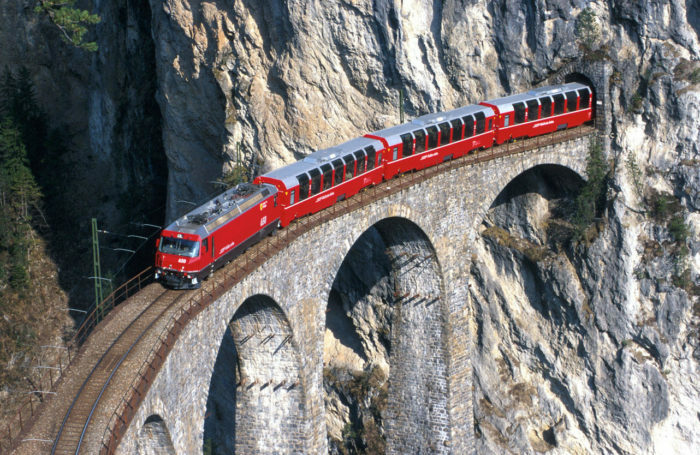 And of those two, I think the Bernina Express is the more scenic ride. It originates in Chur, in the eastern part of the country, and runs through the Alps over the Bernina Pass at an elevation of 7,500 feet, to Tirano in northern Italy. During the four hour ride, the train passes through 55 tunnels and crosses 196 bridges, many of them magnificent examples of stonework, some of it quite old. 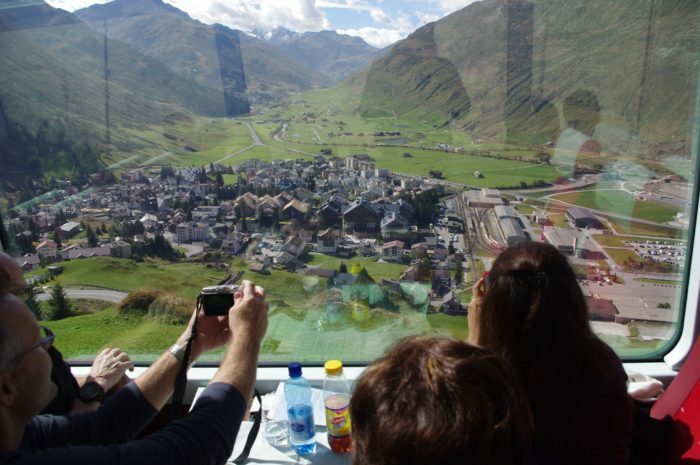 Several times during the journey, the train emerges from a mountain pass and begins a descent to a small city or town so far below it seems as though you’re in a plane. It’s hard to tell because of the reflection in my photo, but you can expect the windows, and everything about these Swiss trains, to be spotlessly clean. The train passes over stretches of track so steep that a mechanism is lowered from the locomotive that grips a saw-toothed rack rail. Without it, the locomotive’s wheels would lose traction. 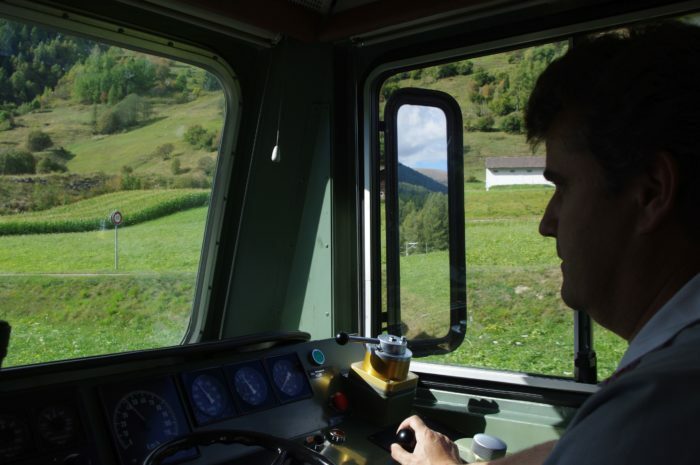 Two years ago, I was fortunate enough to get a cab ride for more than an hour in what is probably Switzerland’s best-known train—the Glacier Express. In my opinion, however, the Bernina Express would be my choice if I had to decide between the two. It’s an incredibly scenic ride and one that’s worth going out of your way to experience. But better yet, do both! Previous What I Miss Most About the Ad Biz. NextA Little More Regulation, Maybe?